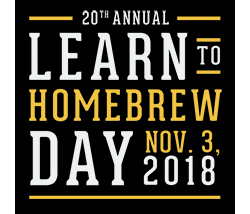 On November 3, the American Homebrewers Association®(AHA)—which this year is celebrating its 40th anniversary—hosts the 20th annual Learn to Homebrew Day, an opportunity for homebrewers to draft their non-brewer friends and family to learn how to make beer at home. Hundreds of lively, educational events are held at homes, breweries, shops and clubs worldwide. Over 300 local celebrations and more than 4,000 participants are expected for this year’s celebration both in the U.S. and abroad. The AHA offers resources to help people of all skill levels begin brewing. Among them is Brew Guru®, a free mobile app which delivers money-saving deals on beer, food and homebrew supplies, plus the finest homebrew recipes on the planet. HomebrewersAssocation.org: Access tutorials for making better beer and download tasty recipes. AHA Forum: Ask and answer questions on homebrewing with the AHA community. How To Brew by John Palmer: Learn from the definitive guide to making quality beers at home. Learn to Homebrew Day was started in 1999 by the AHA to promote homebrewing education in America. The event has now expanded globally, with people participating and hosting their own events around the world. Join the celebration and visit HomebrewersAssocation.org to find an event nearby or register your own. 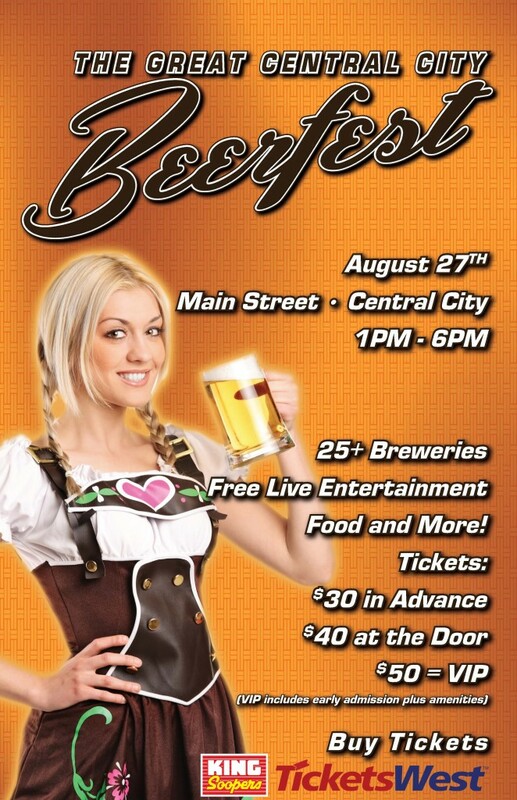 Join us for the Great Central City Beer Festival on August 25, 2018 from 1pm – 6pm! Committed to delivering Coloradans a great experience, one pint at a time. Central City loves the mountains, the laid back atmosphere of the front range, but most of all, the wonderful breweries that CO has to offer, come share in this love. Come sample some of Colorado’s Best Brews. The pours will be flowing all day. 18 breweries will be on hand to serve you up a cold one. Click here for more information, and to purchase tickets! Join us for the Great Central City Beer Festival on August 26, 2017 from 1pm – 6pm! Join us for the 5th Annual Great Central City Beer Festival on August 27, 2016 from 1pm – 6pm! $30 advance / $40 day of / $50 VIP – One Ticket = Many tastes. 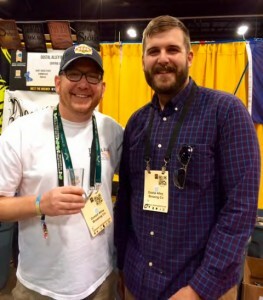 From our loyal U.S. correspondent, Finn Bjørn Knudsen, we yet again this year have a report on the recent Great American Beer Festival®, which takes place every year in Denver, Colorado – practically in Finn’s back yard! Want to read more about this article? Please click here to download! Finn Knudsen, Knudsen Beverage Consulting, was the Keynote speaker at the 2016 Rocky Mountain Microbrewing Symposium at the University of Colorado, Colorado Springs this past February. The Rocky Mountain Microbrewing Symposium is the only conference designed by microbrewers, for microbrewers! The new collaboration between Colorado Malting Company and Viking Malt naturally goes both ways. From now on, Colorado Malting can also offer Viking Malt’s wide selection of quality malts to its American customers. The new collaboration between Colorado Malting Company (CM) and Northern European Viking Malt opens up the European markets to the American craft malt pioneer. Starting in spring 2016 Colorado Malting Company will also start offering various Viking Malt malts to its American customers. The craft beer boom that has taken Europe by storm has always been greatly influenced by the beer culture from the US. However, until now, the availability of American craft malts has been limited in Europe. The new collaboration contract between Colorado Malting Company (CM) and Viking Malt gives Viking Malt a license to produce CM’s malts for the European markets. With this collaboration CM is specifically targeting the rapidly growing European small-scale brewery sector. – We are very excited. We believe that American craft malts can be very successful in Europe and this collaboration opens up many new possibilities for us. Joining forces with a company that has a proven track record will give us instant access to the European markets, says Jason Cody, the president of Colorado Malting Company. The new collaboration between CM and Viking Malt naturally goes both ways. From now on, CM can also offer Viking Malt’s wide selection of quality malts to its American customers. – The state of Colorado has a lot in common with Northern Europe: harsh conditions, relatively short growing season, clean water and nature, and high quality of products. Also the same barley variety is grown both in Colorado and Northern Europe. It’s a good match. It takes character to produce a good beer, and we both share that unique character, says Timo Huttunen, Business Unit Manager of Viking Malt. Viking Malt is the leading Nordic malting company whose client list includes big and small beer breweries and distilleries around the world. The malt houses of Viking Malt are located in Finland, Sweden and Lithuania. The grain used for its malts also come mainly from the same area. The head office of Viking Malt is located in Lahti, Finland. The same family has owned the company for more than 130 years. Colorado Malting Company, based in Alamosa, USA, and founded in 2008, is a rapidly growing American family business that produces various types of malts specifically for craft beer breweries all around the US. 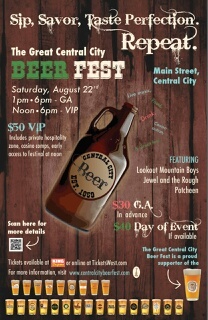 Join us for the 4th Annual Great Central City Beer Festival on August 22, 2015 from 1pm – 6pm! 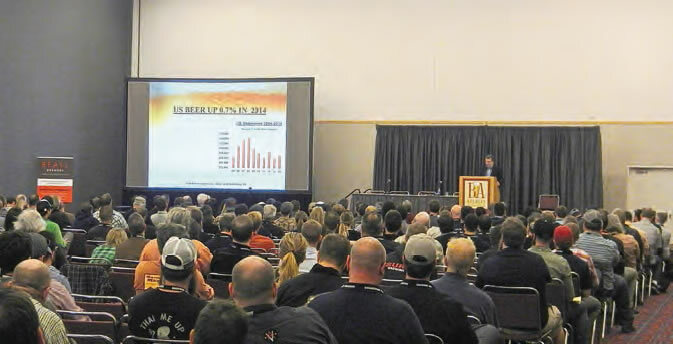 From our US correspondent, Finn Bjørn Knudsen, who lives and works in Colorado, we have received this article on the record-breaking 2015 Craft Brewers Conference and BrewExpo America® in Portland, OR. The 2015 Craft Brewers Conference and BrewExpo America in Portland, Oregon, was a “wow” event and the largest ever in its 32-year history!! It was indeed a big, successful event with more than 11,500 registered brewing professionals and 600 exhibitors from near and far. The conference event featured more than 175 speakers and 80 seminars, covering everything from technical brewing to US federal tax code compliance. The Portland Conference Center was a perfect venue for both the exhibitors and various presentations and seminars. The public transportation system, which is better in Portland than in most American cities, served the attendees really well. But Portland struggled with offering a sufficient number of hotel rooms, and we constantly heard that the city’s taxi services were really challenged, since there could often be up to a 1 hour wait or there were simply no taxis available during the convention time. Just the week before the conference, Portland authorities had banned the popular unofficial taxi service “Uber” from operating in the town, which certainly did not help. one week was not enough to be able to visit all! The program for the week started Monday and Tuesday with seminars and specially arranged visits to suppliers and local breweries. Some of the brewery tours were all-day tours, such as visiting Bend – a 3+ hour bus tour one way from Portland. But it was definitely worth the drive, as Bend has a brewery density of Bavarian dimensions: 23 breweries in a town of 80,000 people. The longer trips also included Hood River, Rogue Farm Brewery, Oregon Hop Farm, Metalworks, etc. The registration area opened Monday and functioned really well in the entry hall area, and, among the displays, the popular Chinese Dragon Boat was featured, hanging from the ceiling. The welcoming reception Tuesday evening and the keynote address Wednesday morning were held at the large Veterans Memorial Coliseum, normally home to the city’s successful basketball team, The Portland Trail Blazers, close to the Portland Conference Center. The keynote address was an inspirational presentation by the leadership expert and anthropologist Simon Sinek. Based on the four chemicals our own brains release in order to influence our behavior – adrenalin, serotonin, dopamine and testosterone – Sinek focused on themes from his most recent publication, Leaders Eat Last: Why Some Teams Pull Together and Others Don’t, which addresses how to create conditions in which people can be creative and feel safe enough to take chances. On Wednesday morning, the BrewExpo America® 2015 exhibition opened, and it lasted through Friday noon. The hall was well-visited during its opening hours, and I talked with many brewers who were very pleased with the number and quality of exhibitors. Just to mention a few of the exhibitors: Birko – Henderson, Colorado, Siebel – Chicago, Illinois, Praj – Mumbai, India, Wild Goose – Boulder, Colorado, Deutsche Beverage Technology – Charlotte, North Carolina. Plus, obviously, all the “usual suspects” were there. In total, the number of exhibitors was around 600, reflecting the boom in the number of craft breweries mainly in the US, but also on a worldwide scale. There were many excellent presentations and, as an example, the one by Benji Steinman, “Halfway Home? Craft Continues Climbing, but Ascent Gets More Complicated”, provided a great analysis of the current status of the craft brewing industry and where it is heading with reference to the big brewing companies. Definitely, there will be some acquisitions and mergers happening in the future. In this magazine, we have earlier asked the question whether the CBC is becoming too big, and certainly some issues this year in Portland more than indicated that the challenges of having so many attendees are hard to handle. The conference center had to close the doors very early in order to limit attendance in the otherwise rather large presentation rooms, as they very quickly filled up, making the number of people in the rooms exceed the legal capacity. Obviously, when the attendees have paid very good money – the price tag for the full conference this year was $180 – to attend, it is not acceptable that they cannot attend the presentations they have chosen. Worth mentioning is that the BA collaborated with the Oregon Brewers Guild on this year’s commemorative beer – the 2015 CBC Symposium Ale. Since Oregon is home to so many craft breweries, the guild opted to brew six different commemorative beers representing the coast, central Oregon, the Willamette Valley, and Portland proper (with three from the latter). Each beer was a collaborative effort among breweries from the given area, while a variety of industry suppliers provided the ingredients and packaging. During this year’s conference, the 2015 Achievement Awards went to members of the brewing community who were recognized for their dedication and service. The Russell Schehrer Award for Innovation in Brewing went to Steve Dresler, Sierra Nevada Brewing Co. The Brewers Association Recognition Award went to Dave & Diane Alexander, Brickskeller, Washington, D.C., and the F.X. Matt Defense of the Small Brewing Industry Award went to Brook Bristow, South Carolina Brewers Guild. 2014 data about U.S. craft brewing growth. For the first time ever, craft brewers reached a double-digit (11 percent) volume share of the marketplace. The full 2014 industry analysis will be published in the May/June 2015 issue of The New Brewer. More detailed information about 2015 CBC can be found on its website: www.craftbrewersconference.com. Please do plan to attend the 2016 CBC, which will be held in Philadelphia, Pennsylvania, from May 3-6, in conjunction with the 2016 World Beer Cup®. If you would like to attend the 2015 Great American Beer Festival, September 24-26, then please visit their website, www.greatamericanbeerfestival.com. Please keep in mind that, in the past, the regular tickets have sold out in less than 30 minutes. Members get a chance to register the week prior. Finn Bjørn Knudsen, M.Sc. – Ch.E. (KP) lives in Evergreen, Colorado, USA, where he, for quite a few years, has run his own firm, Knudsen Beverage Consulting. Finn started his career on his home turf of Denmark with the Tuborg Breweries. But, at a relatively young age, he moved to the US and Canada, where his corporate career really took off working for Molson. He then returned to Denmark to work in the Carlsberg Group and went on to hold a long-time post as Technical Director of Coors Brewing in Golden, Colorado, before working as Technical Director for Procordia Beverages/Pripps in Stockholm, Sweden. Finn finally returned to the US, where he started his consulting company in 1993.